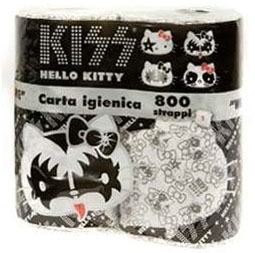 The Cartoon Brew has a picture of new “Hello Kitty/KISS” toilet paper, blending the Japanese cartoon character with Gene Simmons’ demonic-image rock-music label. Unexpected licensed merchandise of cartoon anthro stars are nothing new. There is the Spongebob Squarepants child’s rectal thermometer, for example. Most of it is for children’s products, though. Not Hello Kitty. The mouthless one, Kitty White, was created as a little girl’s merchandising icon by Sanrio Ltd. of Japan in 1974, to appear on school notebooks, junk jewelry, coin purses, and the like. Today those little girls have grown up, and want Hello Kitty on adult merchandise.